A post by conservator Zoë Lanceley. As well as caring for the objects in the People’s History collection, the Textile Conservation Studio also carry out work for private clients. This helps to support the wider work of the PHM. I am currently working on one of his hats, a stylish tricorn cocked hat with metallic braid, tassles and a black silk corsage. Just below the corsage is a gold coloured button with the triskellion symbol and motto of the Isle of Mann: ‘QUOCUNQUE JECERIS STABIT’ (Whichever way you throw, it will stand). The term ‘cocked’ refers to the three sides of the brim which are turned up. 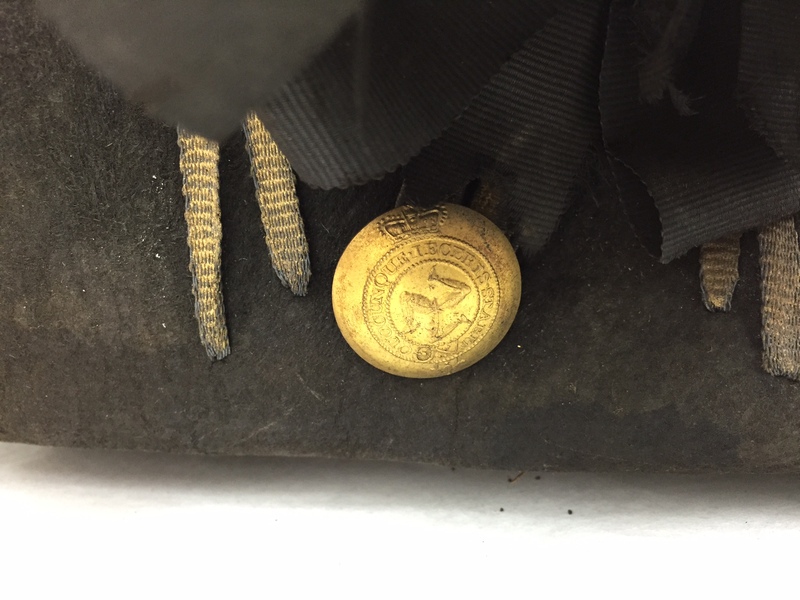 George Quayle’s initials are inside the hat, as well as the maker’s paper label. The makers label reads: ‘Wagner, Hat maker to their Majefties (sic), Pall Mall, London’. As well as making hats for the Royal Family, Wagner’s also made hats for the military. You can tell George Quayle wore his hat many times as perspiration is present around the lining of the crown. 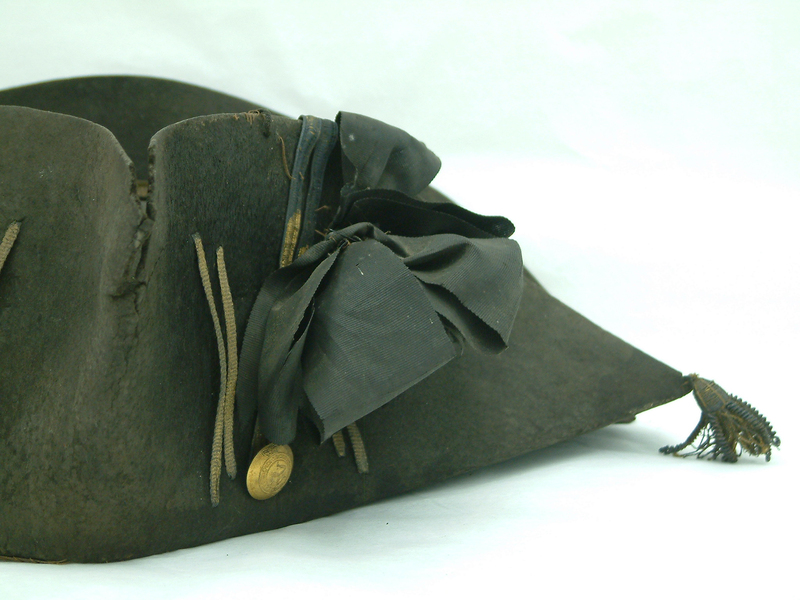 The hat is made from a single piece of beaver fur felt and dates from about 1790. At this time lots of different furs were used to make felt, but the finest hats were made from beaver fur felt. During the manufacturing process it was necessary to use a form of mercury (mercuric nitrate) to felt the fibres together. Unfortunately mercury is very poisonous, and hatters (who made hats) often became very ill, displaying symptoms such as shaking and hallucinations. This is where the term ‘Mad as a hatter’ comes from. When I looked at the hat under the microscope I made an interesting discovery. The metallic gilt braid has tarnished to a dull grey colour, but in some places gold paint has been applied over the tarnish. It is a mystery to me why or when this was done; did George Quayle do it to spruce up his hat? Or has someone else applied the paint more recently? As a conservator it is really interesting to make discoveries like this, it all adds to the mystery of the past. 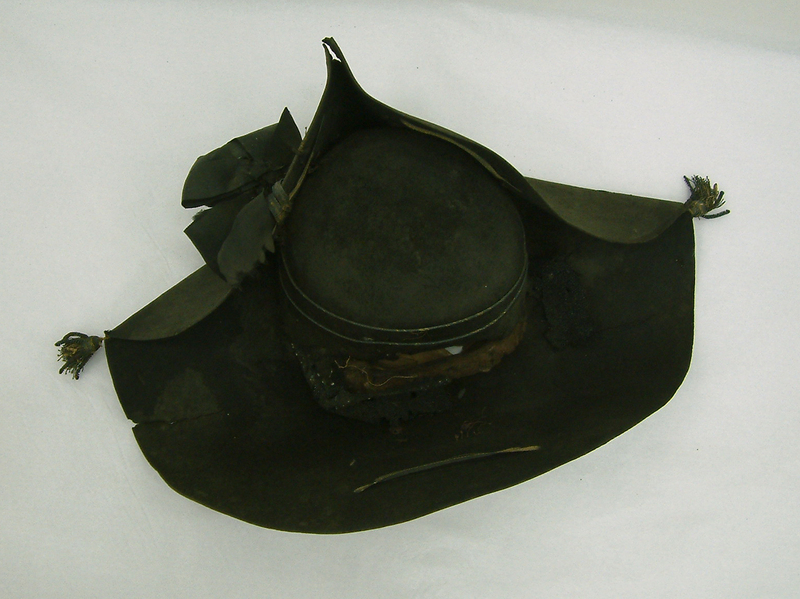 Over its life time the hat has been in the wars and is quite damaged. Most of this damage has been caused by moths, as unfortunately beaver fur is delicious food for moths. They have nibbled their way around most of the crown of the hat and the middle of the silk corsage. The first thing I did to improve the appearance of the hat was to very gently clean the surface with a tiny low powered vacuum cleaner and a soft paint brush. This helped remove dirt and dust which had accumulated on the hat. I also picked off fragments of moth casings (which moths leave behind after pupating from larvae to grown up moths) and loose bits of fabric which had been nibbled free. Initially I had planned to reshape the hat by humidifying it (which would cause the felt to relax), and apply support patches across splits in the felt. Despite my best efforts this wasn’t possible, as the felt remained very rigid even after lots of humidification. Even though the hat looks very fragile, the felt is surprisingly robust. It feels very much like stiff cardboard. 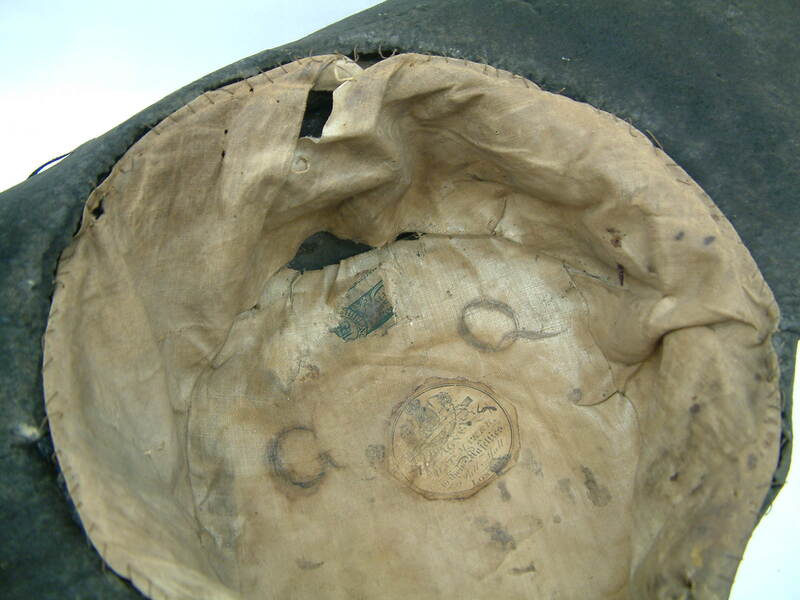 Despite the tough exterior, the lining is still fragile and handling the hat should be kept to the absolute minimum. My priorities now are to make a safe stable support board for the hat to be stored and displayed on. The board will be covered in grey fabric so that it fits in with the exhibition at Manx Museum, and will have a dome on it to support the hat. I am also in the process of making a box for the hat which it can be stored in permanently when the exhibition is over. It is really interesting to work with objects which have been well used by their owner, particularly when you can identify who that person was. I’m sure this hat will make a fascinating contribution to the George Quayle exhibition. 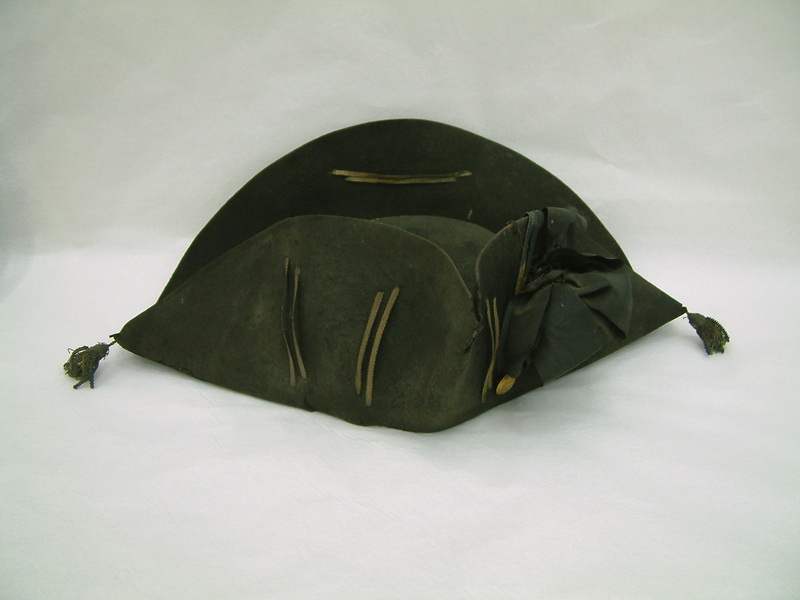 This entry was posted in Conservation, Textile Conservation Studio and tagged Conservation, Hat, Isle of Man, People's History Museum, Textile Conservation, Textile Conservation Studio, The Manx Museum. Bookmark the permalink.